We may have the cast list for the Breaking Bad Movie. While AMC has yet to officially confirm that such a movie is happening, the cat is, more or less, out of the bag. It started with a report from a local publication in Albuquerque and Bryan Cranston also seemingly confirmed that it's happening as well. Still, both the network and series creator Vince Gilligan seem intent on keeping it all a "secret" until the time is right. That having been said, an alleged cast list has surfaced online and, if this is the real deal, it would have major implications for the highly-anticipated project. Before digging in, we must caution, as always with this sort of thing, since it isn't coming directly from the studio or anyone directly related to the production, this should merely be regarded as rumor for the time being. 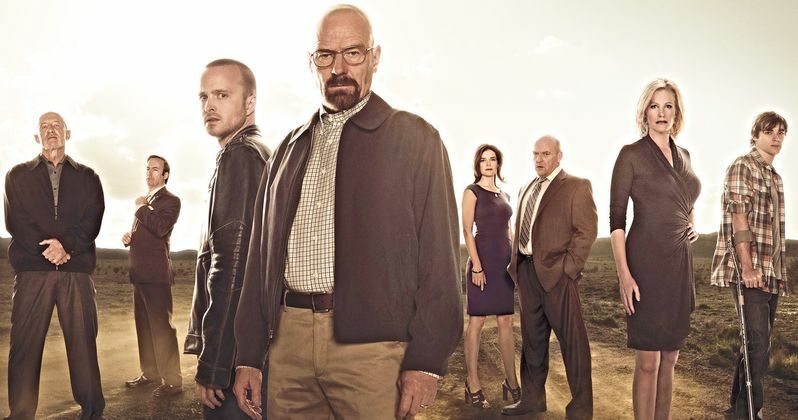 That said, the cast list, according to a new report, will include Breaking Bad alums such as Bryan Cranston (Walter), Krysten Ritter (Jane), Jonathan Banks (Mike), Jesse Plemons (Todd), Charles Baker (Skinny Pete), Matt Jones (Badger), Robert Forster (Ed), Tess Harper (Mrs. Pinkman) and Kevin Rankin (Kenny). Anyone who has seen the series that reads that list knows this would be big. The first, and most crucial element of this list is that many of the characters who would be returning, per this cast list, are dead. Walter White gave his life in the series finale, Jane died tragically choking on her own vomit thanks to an overdose, Mike was shot by Walter. It goes on. So what does this mean for the movie? Well, it would seem that Vince Gilligan is intending to incorporate more than a few flashbacks and dream sequences which, given what we've heard about the project previously, wouldn't be all that surprising. Based on previous reports, the movie, which is going under the working title Greenbrier, will follow Aaron Paul as Jesse Pinkman after his escape at the end of the Breaking Bad finale. Jesse wasn't in terribly good shape when we last saw him and, unquestionably, even if he manages to find some sort of peace, he's going to be haunted by the demons of his past. Literally bringing these demons back through dream sequences/flashbacks would be a great way to theoretically make everything work. Plus, it would allow for more recognizable characters to come back without some crazy sort of retconning. For what it may be worth, Bryan Cranston has repeatedly expressed his willingness to revisit the character of Walter White. That previously seemed most likely as a cameo on the spin-off series Better Call Saul, but now it looks like we may get something far more significant. Speaking of Saul, there is no mention of Bob Odenkirk here, but given that his character went into deep hiding at the end of the show, that would make sense. Hopefully, this actually comes to fruition and isn't just a too-good-to-be-true rumor. We'll be sure to keep you posted as more details come to light. This was first reported by Revenge of the Fans.